Blueberry Muffins! Another great sweet recipe, perfect for the kids and even the adults! Very easy to make and the end results are amazing! You can taste the sweet blueberry’s bursting in your mouth. Makes about 12-14 depending how much mixture you put in each case. 1. Preheat the oven to gas mark 5 so about 180 degrees. Get a mixing bowl and add in the ‘Dry’ ingredients. Even the blueberries if you wish but I put them in with the wet ingredients, its up too you chef! 2. In a different bowl or jug, add in the Vegetable oil, the eggs and the milk. And with a fork or a whisk just whisk or mix its up to you. Mix until you can clearly see the wet ingredients have mixed in with each other. Tip- Try get as much air in the wet mixture as possible, your muffins will be light and fluffy! 3. Slowly pour in the wet mixture into the flour, sugar etc. Give it a good mix, don’t worry if your blueberries are getting squished, they will anyway. Wont change the taste at all, if anything they will be better! 4. Now get your muffin cases all ready. I use a ice cream scooper when putting mixture muffin cases, so this way everyone’s muffins are about the same size. You can use spoons is well they work just as well. What ever you feel comfortable with. Get about two scoops in each case and until you have no mixture left that might mean getting some more muffin cases if you have extra. Try get roughly the same amount of blueberries in each muffin or at least one. 5. Place in the oven for 20 – 25 minutes until the muffins are golden brown. To check they are fully cooked inside, get a knife and place it in the middle and if the end of the knife comes out clean it is cooked, if it doesn’t it may need a bit longer. 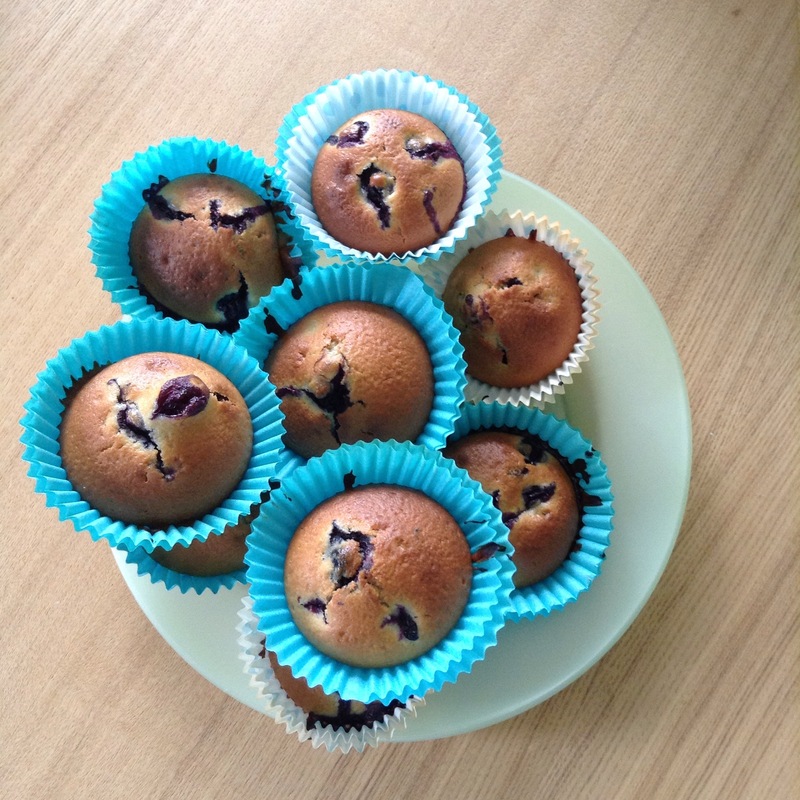 I hope you try this recipe at home, I would really appreciate the feedback and pictures from your blueberry muffins. If you want to try something different perhaps replacing the blueberries for chocolate chips? This entry was posted in Recipes and tagged Baking, blog, Blueberry muffins, Cake, Cooking, Food, Muffins, Recipe, Recipe of the day, Tasty. Bookmark the permalink.